Smoothies might just be my new favorite dessert! If you’re thinking smoothies for dessert? Huh? Go checkout this Healthy Double Chocolate Milkshake or my Blueberry Pie Smoothie. 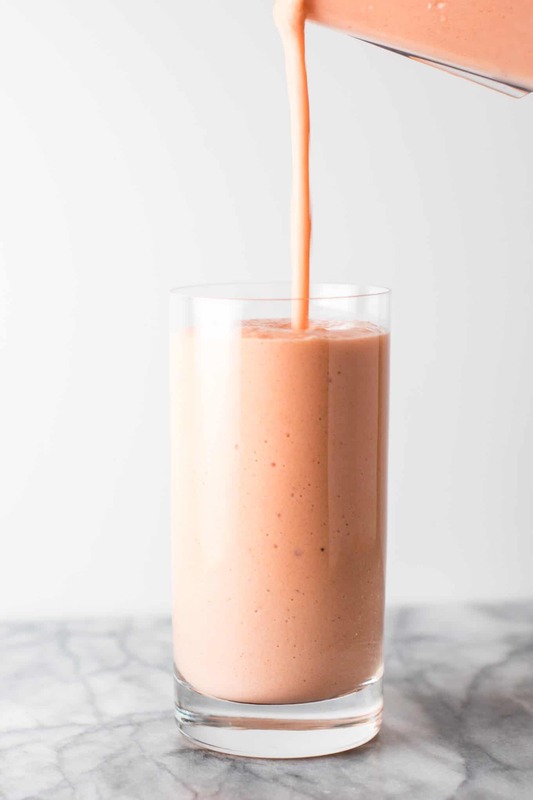 Those smoothies, as well as this carrot cake smoothie, are all great healthier desserts for when your sweet tooth strikes! Smoothies are a great way to satisfy your sweet tooth the healthy way and sneak in veggies too! They are cold, creamy, and thick. All things I love about dessert! 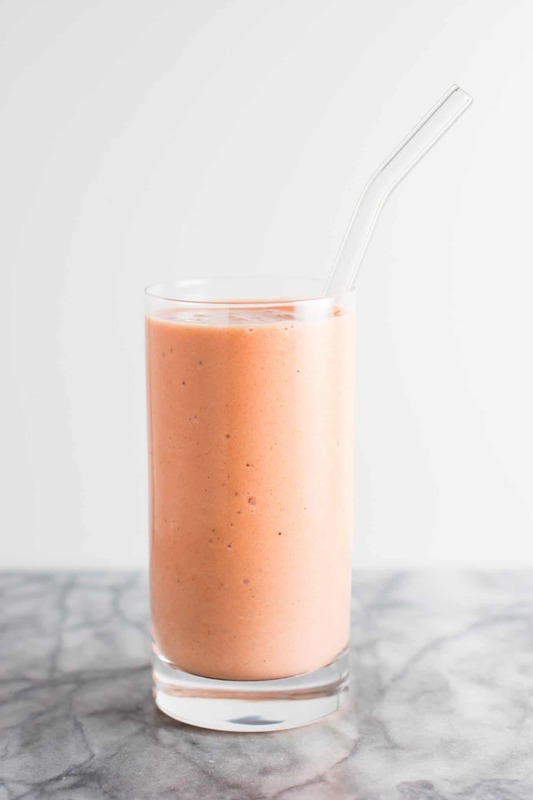 This smoothie tastes like a slice of your favorite carrot cake, but is made with all lightened up ingredients. Just 7 ingredients, or 8 if you count the ice, this really doesn’t take any time at all to make! 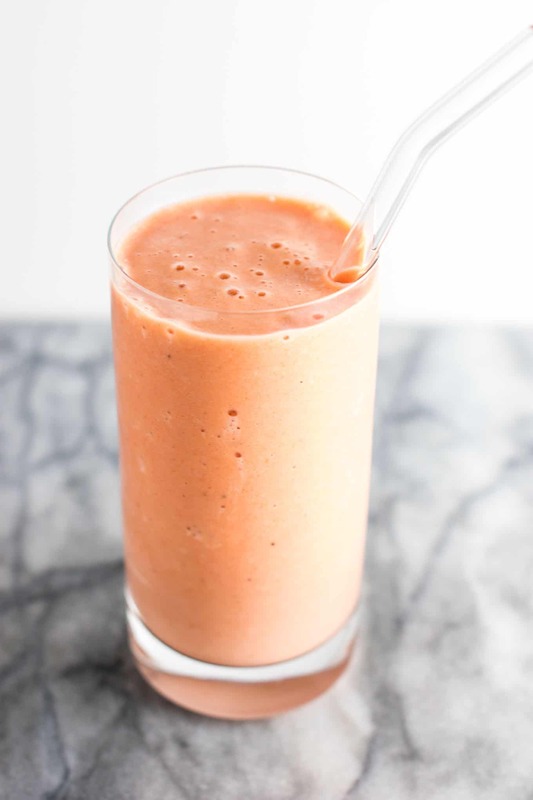 This carrot cake smoothie is so healthy that it could be breakfast or dessert. 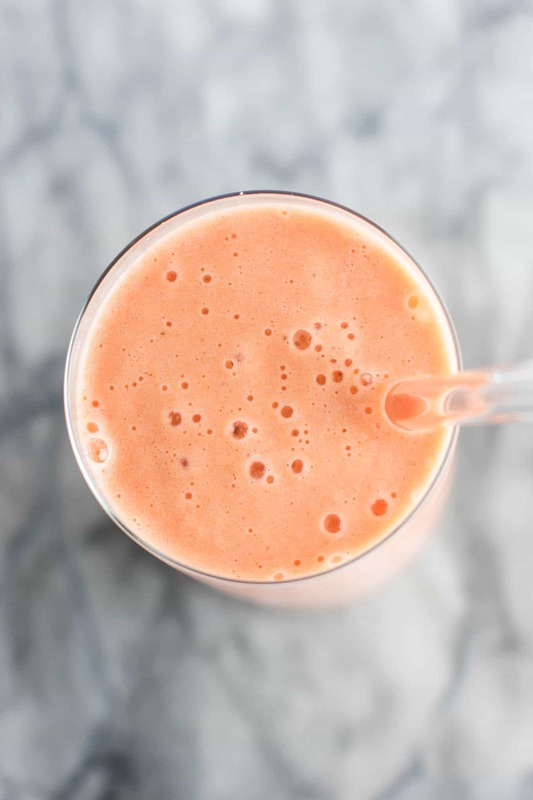 We had ours for dessert, but if you’ve got a sweet tooth first thing in the morning, this is your smoothie. I prefer savory breakfasts usually, but if you prefer something sweet this is a great healthier option than buying a cinnamon roll for breakfast! This recipes serves two, or one really really big smoothie. I’m known for my massively big smoothie recipes. What can I say? I love my smoothies! 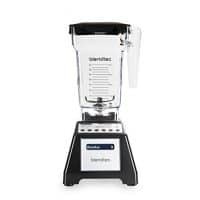 If you have any high speed blender, this recipe will work. 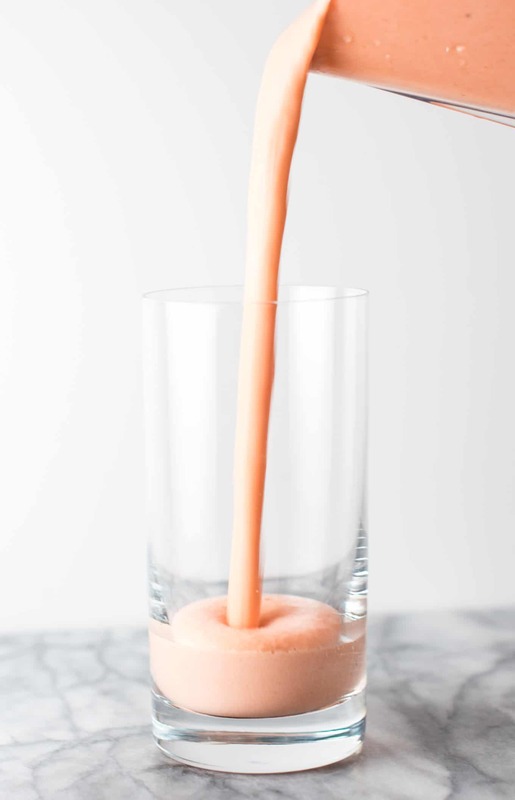 Due to the raw carrots, a normal blender may not be able to blend this up all the way. I love how powerful my blendtec is, and the texture was totally smooth! 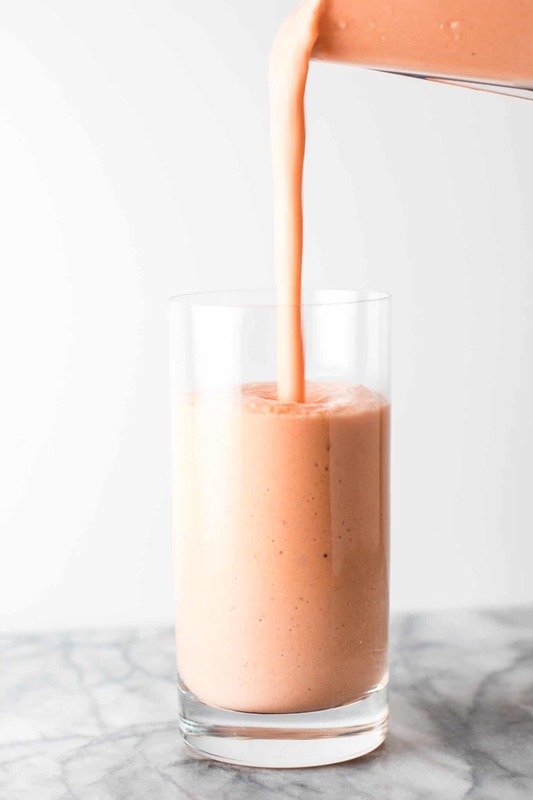 Blend up: raw carrots, frozen bananas, milk, greek yogurt, cinnamon, nutmeg, maple syrup, and ice. Blend on high until totally smooth. So simple and I had it ready to blend in less than five minutes! The greek yogurt adds protein and that “cream cheese” feel of carrot cake. 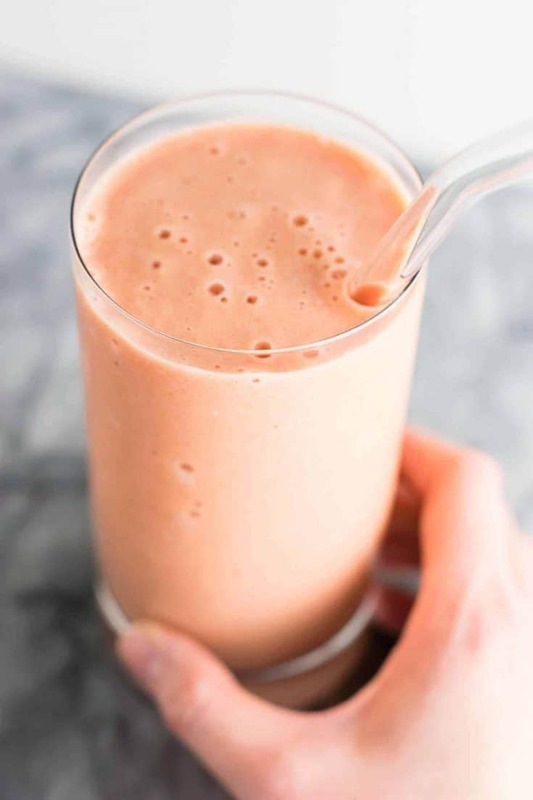 I love using maple syrup as a lighter sweetener option, and it’s perfect for making this smoothie sweet but not overly sweet. As you can tell from the photographs, the recipe ends up being more pink than orange. This will depend on how dark your carrots are I guess. My whole family loved having this for dessert. I tend to always add ice to my smoothies for texture, but this is optional. It’s really just a matter of personal preference. For me, I like my smoothies the thicker the better! Mmmmmm. I’m already craving another glass of this! Carrot cake ready in 5 minutes? Yes please! It came out perfectly smooth and tastes like a carbon copy of my favorite gluten free carrot cake recipe, but in smoothie form. 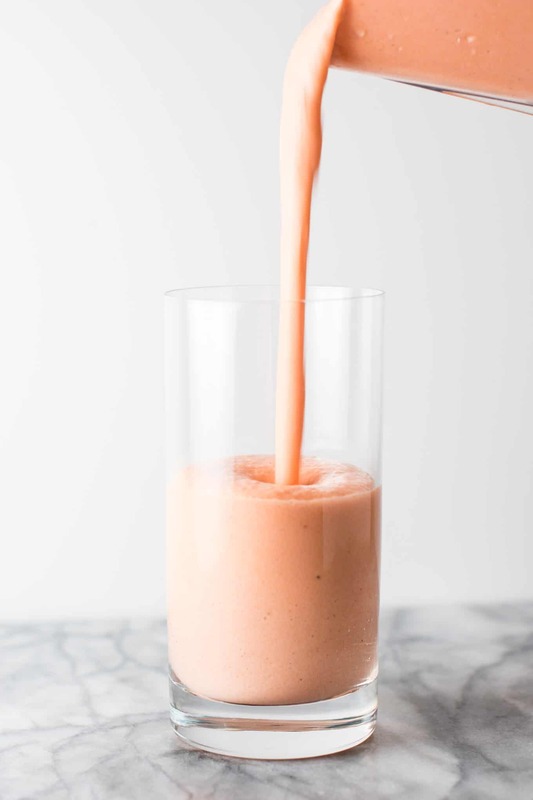 I love using carrots to sweeten juices and smoothies, so I love the sweetness that 3 carrots adds to this recipe. 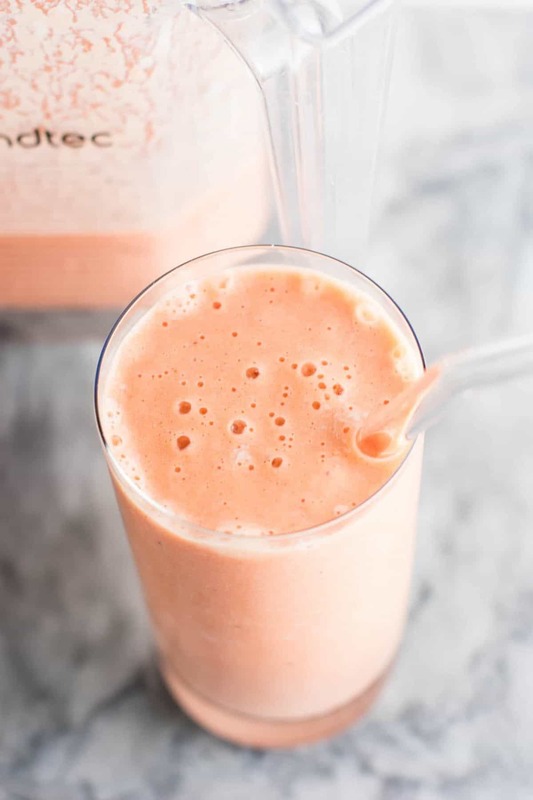 Looking for more healthy and delicious smoothie recipes? Here are a few of my tried and true favorites to make. Smoothies are a great way to make sure you get your fruits and veggies in! Just click on the link to take you to each recipe. Scroll down to the bottom of the post and you will find a printable recipe card with ingredients and instructions. It’s a healthy recipe and Please tells me which time is the best time to drink this smoothie.